Businesses and Government must invest in their country despite the odds — Imran Amjad. Among those that attend the grand and spectacular ceremony were dignitaries from both sides of the island, Prime Minister William Marlin, Governor Eugene Holiday, President of Parliament Sarah Wescot Williams President of the Collectivity of St. Martin Daniel Gibbes, MP,s Frans Richardson, Franklin Meyers, George Pantophlet, Hyacinth Richardson, Silvio Matser, Rodolphe Samuel,Claret Connor Ministers Silveria Jacobs, Rafaeal Boasman, Christopher Emmanuel, Emil Lee, Richard Gibson Sr., Vice Presidents Valerie Damaseau, Steven Patrick and Territorial Councillor Alain Richardson and many others. Also, there were many business people from both sides of the island who joined the Amjad’s in celebrating another one of their accomplishments in the business community on St. Maarten. Speakers include Prime Minister William Marlin, President of Parliament Sarah Wescot Williams, President of the COM Danielle Gibbes, first VP Valerie Damaseau, MP Frans Richardson, MP Franklin Meyers, Hyundai Deputy General Manager for Central America and the Caribbean Taewon Choi, Lee Da Silva from Honda Product Planning and Marketing Manager, and ICT Regional manager for Chrysler/Jeep/Dodge/RAM Jeremy Hart. Each of the speakers congratulated the Amjad’s for believing in St. Maarten, their determination to succeed and their continued support and investing in St. Maarten’s economy and in several social programs, foundations, and associations. The Amjad’s Imran and Farina Amjad along with their oldest son Reza Amjad migrated from Guyana to St. Maarten almost 40 years ago where they began their journey of success. The Amjad’s has dominated the auto dealership industry even though they only entered the auto dealership in 2004 when they bought Marshal’s Motors and rebranded it to Motorworld, they are also the owners of Caribbean Auto, and car rental companies such as Thrifty Dollar. 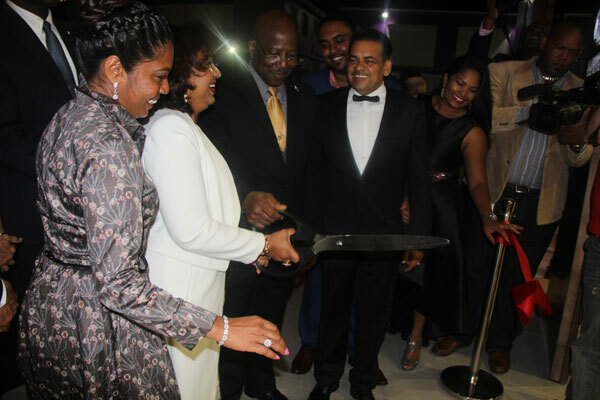 While most of the work and credit was given to the “Iron Lady” Farina “Rena” Amjad and their youngest son Tariq Amjad for executing the construction of the new state of the art showroom that has placed St. Maarten as one of the countries that have the biggest showroom for Hyundai. Farina Amjad in her remarks told the large gathering that when they bought Marshalls Motors in 2004 they were just rookies in the auto industry, they had almost no knowledge on how to order vehicles and spare parts but with determination she and her oldest son Reza who even missed his graduation worked diligently to rebrand and build the company that led them to purchase Caribbean Auto. Mrs. Amjad spoke of the difficulties but also made clear that her family were determined to make every business they own grow successfully, she also gave lots of credit her staff whom she said are dedicate workers.She credited her son Tariq for taking on the responsibility to oversee the construction of the new showroom while managing Thrifty Dollar and Caribbean Auto and nurturing his young family. It is no doubt that the Amjad’s worked day and night to build the businesses they have starting with NAGICO Insurances and now the most dominant in the Auto Dealership Industry. The main speaker for the evening was the Chairman of the Motorworld Group of Companies Imran Macsood Amjad who did not mingle with words when he reminded his guests that he is proud to be born in Guyana, and the grand opening of Motorworld Showroom opening took place on Guyana’s 51st Independence anniversary. Amjad said he did not choose where he was born but the thing he did choose was where he and his family would make their home. Mac as he is mostly known as also made clear to all those in attendance from government to the business sector that they need to learn that they must invest in their country in order for that country to develop. He said even when the economy of St. Maarten is on the downside, his family chose to invest millions in constructing one of the biggest, and modern showrooms in the world and mostly in the Caribbean. “In order to make your country successful, you need to invest even if it’s one dollar as that one dollar would spin around in many ways for the economy to strive. He said that the people of St. Maarten are resilient people because they survived the 1990’s when the island was hit with at least 10 hurricane’s the worst in 1995 hurricane Luis. It is because of their resilience and love for this country that St. Maarten is where it is today. Another message Mac had for the gathering was that despite all of what is said about St. Maarten’s politician whether French or Dutch there is one thing he knows for sure is that each one of the politicians loves their country dearly and that is one thing that has to be respected. His son Tariq Amjad who thanked each and everyone for their hard work, and those that worked on the construction of the showroom also took some time out to admonish the business community on St. Maarten by asking them to clean up their place of businesses. He said all it needs is some paint and team effort, one has to remember that tourism is the country’s only economic pillar and when people visit this country they want to see a clean island with clean buildings while at the same time the people that patronize the businesses on St. Maarten will feel much more comfortable. The young businessman also had a message for the Minister of Finance Richard Gibson Sr that there is no place like St. Maarten, this is one of the most beautiful islands but government must do more to promote St. Maarten in order to draw more people here. Young Amjad said when he turns on his television he sees other Caribbean nations are promoting their islands even though they cannot compare to St. Maarten, but nowhere he sees St. Maarten. He said he was born on St. Maarten and can boast that he is from here and he also loves his country just like everyone else. At the grand opening, the Amjad’s who is also well known for giving back to the St. Maarten community made some presentations to foundations that they have been supporting over the years. Among them were Conscious Lyrics Foundation, K1 Britannia, Rotary Sunrise, Manasseh Academy, and the French Baccalaureate program. While the ceremony took a late start with lots of speakers, invited guests were comfortably seated and were served with snacks and beverages. The ribbon cutting was done by Mrs. Farina Amjad and Prime Minister William Marlin while the other family members and invited guests looked on. Motorworld and Caribbean Auto will be having a sale the whole of next week where customers will get a discount and gifts as they purchase their new vehicle. While the Amjad’s were clearly joyful at the opening ceremony of the master showroom, Mrs. Farina Amjad and her husband Imrad Amjad called their two sons and daugher in laws Manisha and Felisha to the podium and told them now that her husband has reached the golden age of 60 she will work less and their busnesses are now in their hands to manage.